Here’s how to turn one simple Ikea find into decorative—yet useful—home accessories. We all know to head to Ikea when we’re in need of a little Nordic design pick-me-up. But did you know the Swedish retailer also has a mean French Country game? If you don’t believe us, you need to see how we reimagined one of the brand’s $4 dish towels. 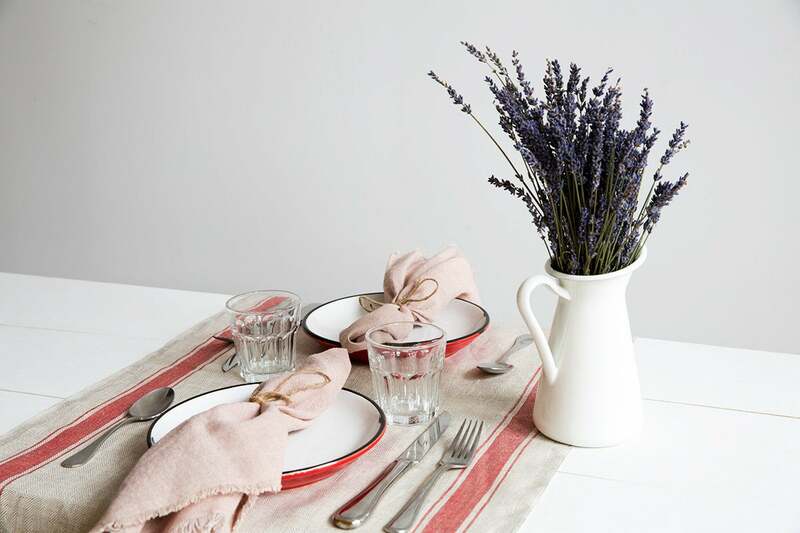 This dish towel in particular is perfect as a runner for smaller café tables (or even if you’re trying to upgrade lunch at your desk). The stripes running along each side give it a more substantial feeling and practically call out for some country cool place settings. Yes, that’s right: dish towel as throw pillow. It’s an easy and super affordable way to get that rustic, farmhouse feeling without stocking up on vintage grain sacks. For this hack, we simply used whipstitch and the stuffing from another, less cute pillow. Et voilà! Let me, for a moment, advocate for the use of tea towels as napkins. You don’t need to buy them in sets or worry about matching. Plus, they’re a much more realistic option for those of us prone to eating with our hands (hello, avocado toast). Bonus: When you spill coffee all over your desk, a tea towel will be there for you in ways a napkin never could.